Spacewalkers John Grunsfeld (bottom) and Andrew Feustel are seen after repairing Hubble's main camera and installing the Cosmic Origins Spectrograph during the third of five spacewalks on the Hubble Space Telescope during the STS-125 flight of shuttle Atlantis. HOUSTON -An ambitious attempt by Atlantis astronauts to fix the Hubble Space Telescope?sbroken main camera has apparently met with only partial success, with one ofthe instrument?s three photo channels failing to recover as hoped, NASAofficials said early Sunday. Atlantis spacewalkersJohn Grunsfeld and Andrew Feustel spent 6 1/2 hours working on Hubble on Saturdayto revive the observatory?s broken Advanced Camera for Surveys and install apowerful new spectrograph. 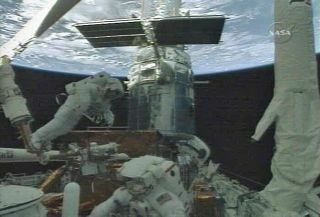 It was the third of five spacewalks planned fortheir 11-day mission to overhaulHubble for the last time. NASAspokesperson Josh Byerly said engineers were unable to revive the camera?s high-resolutionchannel, one of three science-collecting channels it used to observe the universebefore a crippling electricalshort in 2007. That electrical short shut down the camera?s high-resolution andwide-field imager channels, though a third mode - a solar blind channel forstudying objects in the far ultraviolet realm of the light spectrum - was laterregained. ? Thehigh-resolution channel ?is likely down for good,? Byerly said in a NASA TV update just before 1:00a.m. EDT (0500 GMT). The other two channels are in fine health, which still represents a major increase in science with the return of the wide-field channel, he added. At the timeof its 2007 failure, the survey camera was Hubble?s most heavily-used instrument,but it was never designed to be fixed in space. Recoveringthe high-resolution channel was always expected to be a long shot, withengineers and astronauts focusing most of their efforts on the camera?swide-field channel, which generates more science, Byerly said. ?This wasexpected and there is not a surprise to the team here,? Byerly said. ?There is really not much that can be done at this point.? Atlantis astronautsare in the midst of a tightly-scripted series of spacewalks that span fiveconsecutive days. Later today, they will begin their fourth spacewalk, anexcursion aimed at anothertough repair to revive a broken spectrograph. A fifth spacewalk on Mondaywill include vital maintenance work. The mission is NASA?s fifth and finalshuttle flight to Hubble before it retires its three-orbiter fleet next year. Earlier inthe mission, they performed some much-needed maintenance and added two brandnew instruments: a powerful panchromaticcamera capable of scanning deep into the universe across the ultraviolet,visible and near-infrared spectrum; and the most sensitive spectrograph eversent to space, which will use faint light from distant quasars to help measure thechemical makeup of objects in space. For Saturday?sspacewalk, NASA engineers devised custom-built tools and techniques to resurrectthe wide-field camera channel. The fix called on Grunsfeld and Feustel toreplace four electronics boards after removing a pair of cover panels and 32screws. Despite never being done before, the spacewalk repair went off withouta hitch and power to the wide-field channel was restored. Because ofmission time constraints, Hubble engineers chose to focus the repair on thewide-field channel because 95 percent of the camera?s science observations areperformed by that channel alone, Byerly said. Forexample, it was the camera?s wide-field channel that astronomers used togenerate Hubble?s Ultra Deep Field, a snapshot of one area of the sky that revealedmore than 10,000 galaxies and peered back to within 700,000 million years ofthe birth of the universe. The universe is 13.7 billion years old. The high-resolutionchannel was used for smaller field of view observations, as well as studyingfaint objects around bright stars. After Saturday?s spacewalk repair, Hubbleengineers hoped to reroute power to the high-resolution channel through itsfixed wide-field counterpart, but were prepared if the plan didn?t work, Byerlysaid. ?Theoutcome of these repairs is very uncertain,? Hubble program manager PrestonBurch said before launch. Hubbleengineers had suspected that a short circuit inside the high-resolution channelfrom the earlier failures might prevent its recovery, Byerly added. Evenwithout the high-resolution channel, Atlantis' flight has met most of NASA?s missionsuccess criteria, which included adding two brand new cameras, vital gyroscopesand batteries, and a critical data handling unit. The partial repair of themain camera, and today?s attempted spectrograph fix, are desirable but notcritical, mission managers said. ?There wasnot that much surprise in this and not that much disappointment,? Byerly saidof Hubble?s science team on the partial camera repair. ?They consider it asuccess.? SPACE.comis providing continuous coverage of NASA's last mission to the Hubble SpaceTelescope with senior editor Tariq Malik in Houston and reporter ClaraMoskowitz in New York. Clickhere for mission updates, live spacewalk coverage and SPACE.com'slive NASA TV video feed.